An antique piece in a modern decor is like an oasis in a desert! After a while deserts become monotonous and sterile! The straight line is a mostly human invention. Nature hardly has any straight lines and when we try to imitate it we invent what we call “organic forms”. Straight lines were invented by ancient mathematicians not by artists. At a lecture given by our great friend and mentor Albert Sack in New York in the 80s, a person from the audience asked him: “Mr Sack, what is it about antique furniture that is so pleasing and comforting to the eye?”. His answer was: ” It happens mainly because it is organic!”. Everyone was amazed by his answer. He explained: ” antique pieces through the centuries have their straight lines becoming curved, thus becoming organic. It happens as a result of the pieces coexisting with people who touch them, wax them, use them, they even get rounded from friction with the air molecules that soften their sharp angles and even their straight edges become somewhat curved, ever so slightly. Our eyes can detect this and as these antique pieces gradually become more organic they also become more pleasing to our eyes, as by our nature we are attracted to things organic. If you want to find out whether a piece of furniture is modern or antique, run your hand across the edges of it. If its angles are sharp, it is most likely modern”. We are getting used to straight lines because our minds tend to simplify things. However, are our minds also getting simpler when it comes to perceiving beauty and art? The ancient Greeks knew more about beauty and what is beautiful than we will ever know. Those famous painters, architects, sculptors through the ages created masterpieces that we presently analyze with computers in order to find out how they conceived and why are they so beautiful. But THEY knew, because they were surrounded by superior art, they studied it, they were deeply affected by it, they let it enter their whole existence and when that happened, they tried to better it. The most talented ones became our icons. Having lived with art since my infancy I remember my father, a sculptor, saying that we are losing our capacity to understand and appreciate beauty. His professors at the University of Athens understood much more than what they could teach, as their students did not have the patience to think in a complicated artistic way. The famous architect and painter Le Corbusier once said: “Creation is a patient search.” Our society has no time to appreciate complex art. Thus we created simple shapes with straight lines and Minimalism. So today’s decorators have a field day with straight lines and rectangular shapes and uncomplicated figures. Once in a while they throw in a piece with organic curves to warm up a cold minimalist decor. But most decorators nowadays have no training or ability to combine. However we marvel at the creations of those who do! We have seen such modern environments change drastically by introducing “one single antique piece of furniture”. It didn´t have to have heavy carvings or elaborate curves. Just an attractive well proportioned ”organic” form…and thus in the desert there appears a beautiful oasis! Antique furniture suffers from changes across its life. Many times these changes are subtle and for the benefit of the piece such as the patina it acquires from careful use, which most often benefits its character and beauty. But in general whatever alteration from its original state is harmful to the piece, diminishes and could make it lose all its value as an asset and as an investment. Even any change with the intent to alter it or improve it could annul its value too. 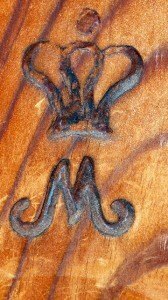 Later added carving, veneering and marquetry, change of supports/legs, handles of different period, even escutcheons that look like ivory, whatever change with the intent of giving the piece higher importance that its original one, is harmful to its value. In countries that have a long history and culture of antique furniture, these “alterations” are obvious and a good expert / dealer should be able to recognize them immediately, provided there is sufficient knowledge to detect them. During the last few decades in Spain there was antique furniture sold for high prices that were altered by the dealers who sold them. The great disappointment to the owner of the piece comes, when and expert gives his/her opinion about the piece and its value. We receive daily dozens of emails with photos offering us pieces that are supposedly antique. Unfortunately the great majority of them are not antique, nor are they desirable thus not having any value. As the great Albert Sack used to say: “there are people who own antiques and people who think they own antiques”. Naturaly at the level of Albert Sack, he also referred to people who own antique furniture wih originality problems, thus without any value. Should one pay the same price for a painting that is confirmed original as one that is a copy? It would be like as one would consent to a bad investment. An antique piece of furniture is a work of art and therefore should be an original, it is a sculpture in wood. Sometimes when an antique piece is bought as a utilitarian piece only, originality may have little importance, provided the price paid is small and inconsequential, similar to buying a contemporary piece. In past centuries as presently, there were mass production factories of useful pieces. As the emphasis was on the low price, the quality and beauty of the piece was a secondary factor. Buying such a piece today is quite common and can not be considered an investment and such pieces being in daily use and abuse, have suffered many changes and are not desireable even as antique. To the contrary, when a antique piece commands a high price, representative of a piece of high quality, whatever change that it incurred during its history diminishes its value drastically. * Owners of pieces who think that they can do their own restoration to avoid the cost of a professional restorer. * Cabinetmakers who make present day furniture and have not full knowledge of the methods and techniques of the cabinetmakers of past eras and try to restore a piece. * Restorers who without specific knowledge of a piece try restoring it for their own monetary gain, thus destroying it. * Owners or restorers who intented giving a piece ” a light refreshement”. * Owners of pieces who adapted a piece of furniture for their own personal use thus destroying it, such as ” reducing the height of the legs, or the top so that it willl fit into a specific spot etc”. * Antique dealers who change a piece or part of it, thinking they are making it more attractive and desirable to sell. Finding an antique piece of great beauty in its original state is always a great discovery for us that fills us with joy as if we found “hidden treasure”. It is obvious that across the centuries, very few pieces survive without suffering small damages. Although these damages are small, restorting them incorrectly could annul the value of a piece. The restorer of a piece should have or should acquire specific knowledge of the original technique and meterials a piece prior to restoring it. Anything to the contrary would mean destroying it! We invite you to our new Art section. The paintings that we exhibit in this Art section provide high decorative value for the money and are not chosen only for the name or signature of the artist. We feel that there are many great artists who for various reasons did not achieve the fame of some of their contemporaries. These are some of the artists that we love to seek and we consider their creations as hidden treasures. You may enter Art by clicking here. This desk is stamped Holland & Sons and bears marks of the royal house during the period of George IV and queen Victoria. Holland & Sons started as the cabinet makers and upholsterers called Taprell and Holland, by 1843 they changed their name to Holland and Sons with William Holland, a relative of the Regency architect Henry Holland. In 1851 the firm employed over 350 men and in 1852 it incorporated the prestigious firm of Thomas Dowbiggin (1788-1854) of 23 Mount street and took over its Mount Street premises in London. The firm Thomas Dowbiggin had made the state throne for Victoria’s Coronation. Holland and Sons also worked successfully as undertakers and were responsible for the dke of Wellington’s funeral. Under Wlliam Holland the firm became cabinetmakers and upholsters to the Queen, their first commission was for Osborne House in 1845, supplying furniture in the Queen’s favored Louis XVI style. They continued to supply furniture for Osborne and gained further commissions for Windsor Castle, Balmoral and Marlborough House. Holland and sons also worked for many leading institutions including the reform Club, the British Museum, Athenaeum Clubs and the Royal Academy. Along with Gillows they shared the commission for the new Houses of Parliament. They were part of many of the important international Exhibitions including London in 1862, Vienna in 1873 and Paris in 1867 and 1872. The firm remained under family control until it closed in 1942. 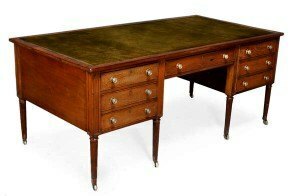 Anticuarium has lately also acquired other important pieces such as a magificent writing desk by Gillows, contemporaries and collaborators of Holland & Sons, which desk has just been sold to a Spanish client. It is not the first time that Anticuarium acquires pieces that have belonged to the British Royal family, such as the Biedermeier commode that was acquired from the Prince Vladimirovitch family that previously belonged and was fire stamped by the Queen Mary royal court. We are happy to announce that our web pages may now be enjoyed through your smartphones regardless of systems and programs such as: iPhone, iPad, Blackberry, Android etc. Furthermore, the photos of our antiques can be aumented with the same clarity and speed as you may be used to do with your PCs or Macs. We would love to hear your comments. What is considered antique in furniture? An antique piece of furniture should be at least 100 years old, all pieces with less than 100 years of age should be old or as commonly used nowadays vintage. However it should be said that there is furniture that is very valuable although not antique. On the other hand, not all that is antique is valuable. The concept of collecting antique furniture is a subject that should be understood better in Spain, where the acquisition of high quality furniture during the last 4 centuries, has been the priviledge of a small minority with abundant resources. Better said, this minority would buy furniture from known and often famous furniture makers who although they used good techniques of fabrication, but very few understood the artistic guidelines of creating a fine piece of furniture, as developed in other European countries. The exact opposite occurred with paintings in Spain, where there existed in abundance some of the most important painters of Europe and the world. Therefore this small minority kept buying from the most renowned furniture makers of each period, with the exception of the public that could travel, purchase and import fine pieces and thus start acquiring the taste of the fine points of furniture. Some furniture makers also were lucky in working in workshops of other countries and thus import their skills to Spain. First and foremost the best possible example of what is being collected, and not necessarily the greatest number or items. Collecting should not be an addiction. The best possible example also means that it should be in the best possible condition and the most original. When parts, originality or authenticity is absent, it is a bad investment. It has been proven that when a collectable item was expensive when first made, it will continue being expensive through the years or centuries and expensive as well as a collectible. As a collector’s guideline this should also probably be the most desirable as a collectible. Scarcity is definitely an important factor in collecting, however, as we have said in the “5 golden rules for purchasing antique furniture” in this Blog, scarcity should be related to Beauty and Desirability. An item may be very rare but if it is not attractive or desirable, it is a bad investment. After all, who wants to keep looking an “ugly duckling” all the time? Daily we are offered “antique furniture collections”, which are neither antique nor attractive nor investment quality. Investment quality does not necessarily mean “expensive”. It means that when some day one wants to sell, the retail value of an item is internationally recognized and the seller can recover one’s investment if not realize a profit. The Biedermeier furniture style is inspired by the French Empire style with modification by incorporating local German traditions particularly old peasant furniture. It is simple and elegant, consisting of clean smooth lines and honest, functional form. The pieces are generally designed on a small scale with graceful and elegant forms, devoid of unnecessary embellishment. Biedermeier furniture craftsman eschewed most forms of ornament, preferring simplicity. When there is ornamentation such as carving there is little detail in the work, although by around 1830 more detailed carving became prevalent. The main decorative motifs employed by the Biedermeier era craftsmen included simple forms of swans, sphinx, dolphins, lion paws, acanthus, lyres, and garlands. Early pieces were traditionally crafted from dark mahogany woods with a tendency towards Empire styling. In later years, Biedermeier furniture was generally fashioned from lighter woods such as birch, grained ash, pear and cherry, and exhibited a clearly more whimsical styling. In the middle class homes the furniture was designed according to the uses of day to day activities like writing, sewing and music-each characterized by different furniture, and quite deliberately separated from the others. This furniture was placed in the same living room in different corners or even the same furniture had a multi use, this concept created the Wohninsel, or the ‘living island’. 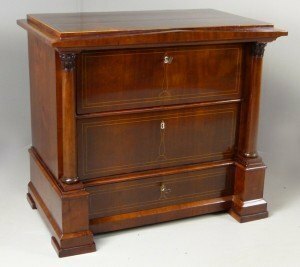 Prior to 1830, mahogany appeared in Biedermeier furniture and gradually replaced walnut. The adoption of this imported wood, which was often given a light finish, caused some craftsmen to apply matching stains and finishes to pieces made in walnut, pear wood, and Hungarian ‘watered’ ash. The Viennese craftsmen no longer relied on the French, German and Italian designers for inspiration. Native products based upon Directoire and Empire designs were highly original, showing a good understanding of form, balance and the use of ornament in gilded bronze. Local timber was used for economy, especially walnut veneer over a soft wood frame. Inlay served as the main decorative element, featuring the patterned graining of walnut and often reduced to a light-colored border. Sometimes, craftsmen used black poplar or bird’s eye maple and colored woods such as cherry and pear became popular. Cabinetmakers decorated their furniture with black or gold paint, and often employed less expensive stamped brass wreaths and festoons rather than bronze for decorative effect and gilded wooden stars instead of the elaborate metal ornaments of the Empire style. Sometimes, they chose cheaper, new materials such as pressed paper. The Biedermeier era produced a wealth of different types of seating, with a myriad of variations on the basic scheme of four legs, a seat, and a back. From 1815-1835, Biedermeier craftsmen discovered that a chair could be given literally hundreds of different shapes. Upholsterers padded their creations with horse-hair and covered them with brightly colored velvet and calico. Pleated fabrics covered furniture, walls, ceilings, and alcoves. By the 1840s the Biedermeier style became romanticizedstraight lines became curved and serpentine; simple surfaces became more and more embellished beyond the natural materials; humanistic form became more fantastic; and textures became experimental. Albert Sack(1915-2011) was the most prominent antique furniture dealer of the 20th Century in the USA. He was our teacher and inspiration in the 80s and always generous with his vast knowledge, to all who had the desire to learn, although they were competitors of his; this way he felt that the level and quality of the entire field rose. On the other hand Sack was very critical with antique dealers whose intention was to deceive the public for their own benefit. For this reason he would say: “if you do not understand antiques, get to know you antiques dealer” and don’t be misled by appearances, big words and eloquent statements that are not based in Knowledge. Lately we have observed in some websites of competitor antiques dealers, that we are being copied, something that would normally flatter us; however we see that names of famous cabinetmakers and periods of their work are being used, in a way that we have used them. Such copying is definitely not flattering us because we see that they are mere attempts to deceive the public and appear that they are at the same level of knowledge as us. Furthermore, they quote dates of execution of these pieces that are totally erroneous and even worse they relate them to famous cabinetmakers, when these cabinetmakers were already dead. To be somewhat specific, some english antique furniture is attributed to the famous cabinetmakers Gillows, and the dates of executions quoted for such pieces is 100 years earlier than their true date, which was the high period for Gillows. We admit that ” Copying is the highest form of flattery” . But when one can not even copy well, it is the highest form of ignorance; and it lowers the level of our entire field…. BIEDERMEIER: Un estilo unico y original - Revelando más detalles!